"Sampath Speaking" - the thoughts of an Insurer from Thiruvallikkeni: Alderman ~ workman compensation - Notional Extention !! Alderman ~ workman compensation - Notional Extention !! An ‘Alderman’ ~ is a member of a municipal assembly or council in many jurisdictions founded upon English law. The term may be titular, denoting a high-ranking member of a borough or county council, a council member chosen by the elected members themselves rather than by popular vote, or a council member elected by voters. The title is derived from the Old English title of ealdorman, literally meaning "elder man", and was used by the chief nobles presiding over shires. In the Boxing Test at Melbourne, Jasprit Bumrah's first- Test man of the match award is a fitting end to a dream debut year.The right armer with a different arm action and sublime control had his best Test figures of 6-33 in the first innings as Australia were skittled for 151.Only Australian Terry Alderman and West Indian Curtly Ambrose have taken more Test wickets in their first calendar year. 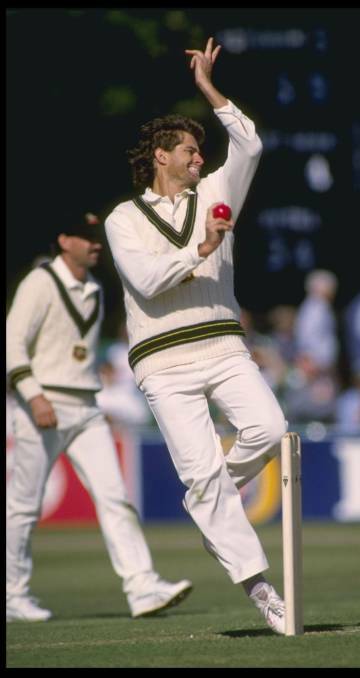 In case, you have heard only of Max Walker, Dennis Lillee, Jeff Thomson, Rodney Hogg, Geoff Lawson, Carl Rackemann, Craig Mcdermott, Merv Hughes, Bruce Reid, Glenn McGrath, Brett Lee …. – there was Alderman, who flummoxed England and especially Geoff Boycott.. ..
Terence Michael Alderman was a right-arm fast-medium bowler, who began his career playing for Western Australia in the Sheffield Shield and came to international prominence when he was chosen for the Australian national team to tour England in 1981. He was a poor batsman, passing fifty just once in his career and averaging barely eight in first-class cricket. In the 1981 Ashes series he took 42 Test wickets, including nine on debut, the biggest haul in a series since Jim Laker's 46 in 1956 and the fourth-highest total of all time. He was rashly tacked by an English supporter invader at Perth in Nov 1982 and that injury forced him out of action for a couple of years. In between Alderman took part in an unofficial Australian tour of South Africa in 1985–86 and 1986–87, when that country was banned from Test cricket as a Commonwealth anti-apartheid sanction. As a result, he received a 3-year ban from international cricket which disqualified him from playing in the 1985 Ashes series in England. He was to return in 1989 Ashes taking 41 wicket again .. .. but could not enjoy similar success against other Nations. After traversing this length, this is no post on Cricket but on ‘notional extention theory’ under Workmen compensation. A simple Q on why the workmen was there at the place of accident – whether it was necessitated by employment or was he there on his own volition, as any other member of public. Employees Compensation Act (Amended) 2009 [Workmen Compensation Act 1923 earlier] – provides for payment of compensation by the employer to his employees (or their dependents in the event of fatal accidents) in respect of personal injury due to accidents arising out of and in the course of their employment. The beneficial enactment aims not at compensating the workmen the wages, but provides for compensation for the injury or death. The amount of compensation depends on the nature of the injury and the average monthly wages and age of workmen. The cause of action pertained to a Ticket collector in a Railway company. The applicant, a travelling ticket collector in the employment of the respondent railway company, had, in the course of his duty, to travel from Oxford, where his home was, to Swansea, where he had to stay overnight, returning thence on the following day to Oxford. He had an unfettered right as to how he spent his time at Swansea between signing off and signing on, and he could reach the station by any route or by any method he chose. In proceeding one morning from his lodgings to Swansea station to perform his usual duty, he fell in the street and sustained an injury in respect of which he claimed compensation. The House of Lords held that the applicant was not performing any duty under his contract of service and therefore the accident did not arise in the course of his employment. The reason for the decision as recorded was : "........ when he (the applicant) set out from the house in which he had chosen to lodge in Swansea to go to sign on at the station he was (and had been ever since he had signed off on the previous afternoon) subject to no control and he was for all purposes in the same position as an ordinary member of the public, using the streets in transit to his employer's premises." This case, therefore, applies the principle that if the employee at the time of the accident occupies the same position as an ordinary member of the public, it cannot be said that the accident occurred in the course of his employment. This is a, simple case of an employee going to the station as any other member of the public would do, though his object was to sign on at the said station. After considering the decisions on the subject, the learned Lord concluded thus : "When all the cases have been looked at and considered, one is finally brought back to the words of the Act, "'the course of the employ ment". The course of the employment begins when the workman enters the employment, and it ceases when he leaves the employment, it being his duty to do both." Interesting and time-bound principles do not change !